An additional source of glucosamine and chondroitin, it contributes to normalization of musculoskeletal system functioning, natural regeneration of cartilaginous tissue and connective tissue strengthening. 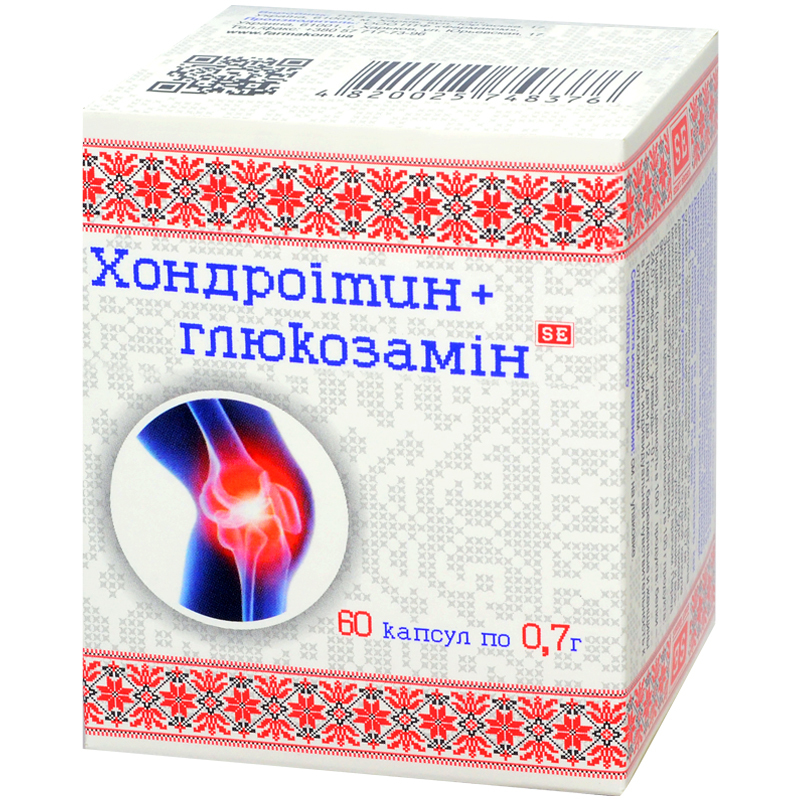 D-glucosamine hydrochloride – 385.0 mg, chondroitin sulfate – 308.0 mg, excipients. Chondroitin sulfate is a high-molecular polysaccharide, acting as an additional substrate for healthy cartilage matrix formation. It activates regeneration of connective and cartilaginous tissues, prevents destruction of bone tissue, relieves pain syndrome in joints. At early stages of inflammatory processes chondroitin sulfate reduces their intensity, slowing down the process of cartilaginous tissue degeneration. It stimulates synthesis of hyaluronic acid, proteoglycans and type II collagen, supports viscosity of the synovial fluid, promotes improvement of joints function, it has analgesic and anti-inflammatory effects that allow reducing necessity of NSAID administration. Glucosamine hydrochloride is a substance, which is necessary for formation of cartilaginous surfaces of the joints, normalization of synovial fluid production. It reduces glucosamines deficiency in the body, participates in processes of proteoglycans and hyaluronic acid biosynthesis. It relieves pain and decreases intensity of inflammatory processes or joints swelling effectively. Adults take 1 capsule twice a day with food. Term of use – up to 1 month. Further, the term of use and the possibility of repeated use are to be agreed with a doctor. Proteins – 24 g, carbohydrates – 0 g, fats – 0 g.